This statment was taken from Indymedia UK. 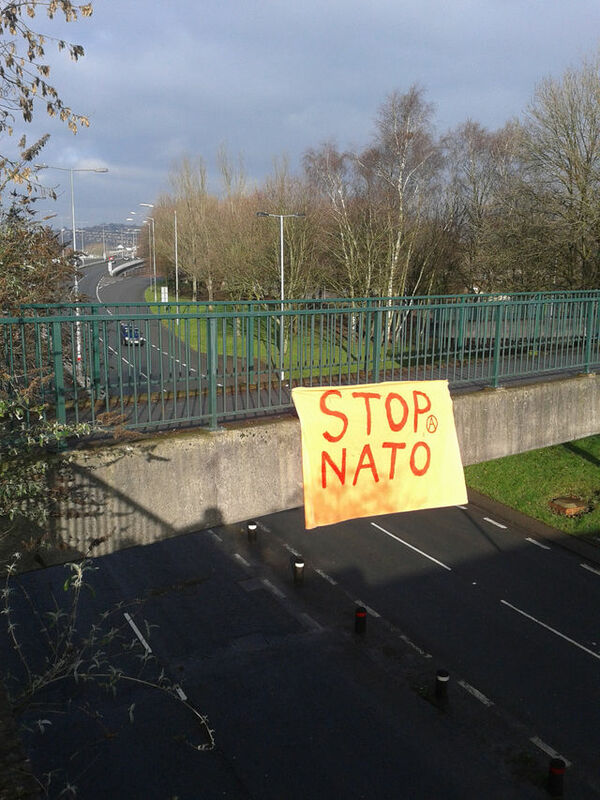 Today several banners were dropped at various locations around Newport, south Wales as an act of solidarity with the NATO 3 and to launch the statement below which was handed out in the city centre. For more information about the NATO 3 follow this link. NATO has often used the term ‘humanitarian interventions’ to disguise the fact that it actually fights for the strategic, economic and political benefit of the elite classes within NATO member countries. Militarism and capitalism are part of the same global power structure. A critique and confrontation of capitalism is therefore an indispensable aspect of our anti-militarist stance. As it stands, NATO is a nuclear armed alliance with over 5000 nuclear weapons. It was supposedly established for mutual defence during the Cold War, and should have been disbanded when the Soviet Union ended. Instead, it has expanded and become an aggressive alliance force, engaged in wars with a crusader mentality. For nearly ten years it has been conducting the war in Afghanistan, historically a pivotal region between the West and the East, where around 100,000 innocent civilians have died and three million innocent people have become refugees. But a critique of militarism and capitalism doesn’t end with NATO: The annual global military expenditure stands at over £1,072,600,000,000. Spending is estimated to equal £150 per person, per year, across the world. The UK military budget is the fourth highest in the world. At a time of austerity we must demand to know why military spending is so high and expose the brutality of those in global positions of power. Most people face much more pressing issues than new fighter aircraft or submarines. People want money spent on local facilities and proper access to social and health infrastructure. Even when the military has made some cuts, these have almost entirely impacted on people in the first instance – rather than material things like arms purchases – through reductions in personnel, lower wages and pensions. The UK still plans to spend almost £160,000,000,000 on new weapons by 2022, including £35.8 billion on nuclear-armed submarines that are designed not to be used. While people around the world struggle to provide basic necessities for their families, governments still squander vast resources on military interventions that are wasteful of both resources and lives, and reflect outdated paradigms. The USA, under the banner of NATO, is still working to place a “missile defence” system in Europe, which is provoking an unsettling arms race with Russia. However, we do not have to agree to their plans for us. People in communities around us are building resistance to military bases in their area. Including in Aberporth, Ceredigion, Menwith Hill in Yorkshire, RAF Waddington in Lincolnshire, Faslane near Glasgow, EDO in Brighton, local people are mobilising and opposing militarism. Newport has a history of radicalism. The Chartist rising, which celebrates it’s 175th anniversary this year, was the last large-scale armed insurrection in Wales, England and Scotland. A popular piece of public art celebrating the revolt was recently demolished ahead of schedule, as part of a planned redevelopment of the centre, financed by a £90million loan which the Council have gifted to developers whilst slashing funds for frontline services. This naive gamble on reviving the fortunes of the town via the pumping of public funds into private companies, joins a long list that includes LG, The Ryder Cup, and now this NATO summit. Together with people from across South Wales and beyond, we are going to mobilise between this winter and September against militarism, Cold-War relics, and inflated defence budgets. Anarchist Welsh Translation is a network of Welsh speakers that do voluntary translations for horizontally organised anti-capitalist campaigns. This translation service is an example of people self-organising using the model of anarchist economics of mutual aid in mind. Now there’s no excuse for monolingual leaflets, posters and websites! The Welsh language will wither away unless it can be a language that people can use in all contexts, including activism. The fight for language rights in Wales is a fight against globalization and capitalism. 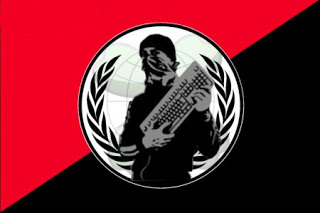 Remember, they only translate documents/posters/leaflets/websites that are not for profit, non-hierarchical and anti-capitalist – in other words, of a broadly anarchist viewpoint. The idea is to promote the email to activist groups in Wales, then they are able to request whatever they require to be translated. Volunteers that are on the mailing list opt into doing the translation and then post it up onto the group so that other translators in the list can proof read. The finished translation would then be sent back to the group/persons that requested it and would then have bilingual material. If you are a Welsh speaker and would like to volunteer, or part of a group that needs translation services. Get in touch!